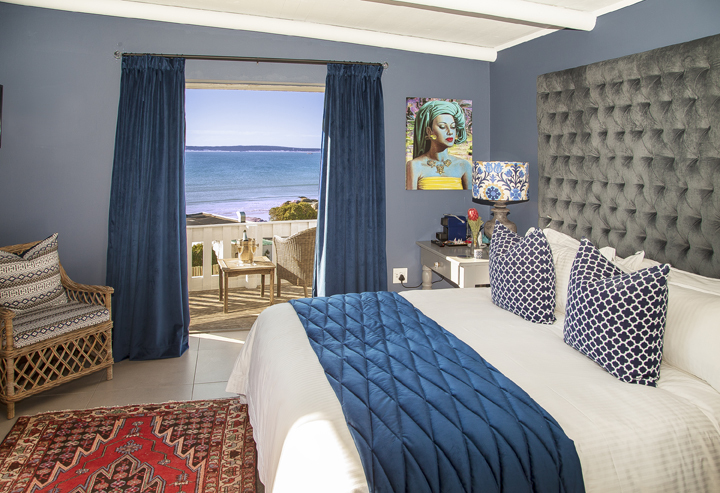 South Africa, Paternoster; PATERNOSTER’S FIRST BUTLER SERVICE is now available at Abalone House’s two newly revamped Pool Villas, situated in the heart of the historic West Coast fishing village. Echoing the vibrant decadence of boutique Abalone House & Spa, the Pool Villas epitomize the finest self-catering accommodation in the village – with butler Xavier Ramsami in attendance to serve a full English or Continental breakfast in suite. Alternatively, breakfast at Reuben’s at Abalone House is offered. The butler service is also available for late afternoon drinks and canapés, as well as for dinner by prior arrangement – both at an additional surcharge. The two Pool Villas are virtually identical and each sleeps two couples or a family of four. With two spacious and magnificently appointed bedrooms with king beds dressed in fine percale linen, and en suite, both bedrooms lead onto the patio and pool; one of the rooms also has a private balcony with 180 degree sea views all the way to the horizon. But wherever you are in the Pool Villas, the ocean is right outside – just beyond the twinkling rim-flow infinity pool, so uninterrupted sea views are everywhere. The main living area is spacious and beautifully appointed with comfortable couches, while the floor is strewn with Persian carpets. Oversized, colourful Tretchikoff prints add pizzaz to walls. 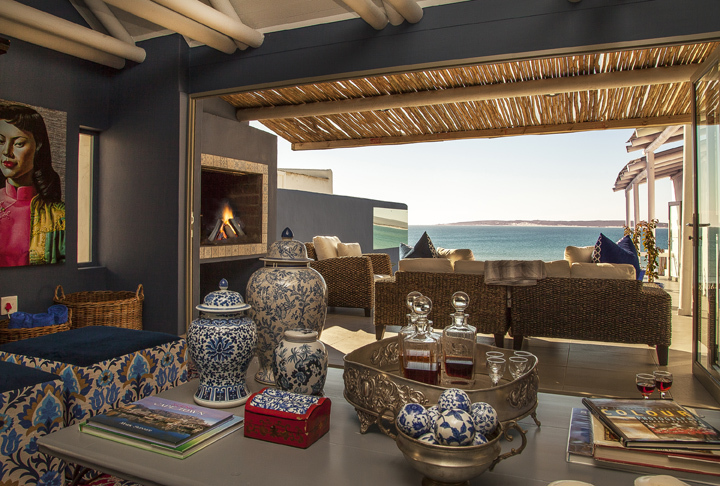 Touches of delft blue and a single red piece can be found in the living area and bedrooms. A coffee pod machine dots each room in the Villa and there is complimentary Wifi throughout. For winter evenings, there’s a cosy indoor fireplace, along with a Smart TV and Netflix to enjoy – maybe accompanied by a sherry or two. Summertime, the large glass stack doors can be completely folded back to allow indoor-outdoor living around the pool and braai area. There’s also a convenient outdoor shower for washing off beach sand before jumping in the pool. An enticing selection of restaurants are within walking distance of the Villas and serve simple to sensational cuisine, by day and night. However, the fully-equipped and stylish Villa kitchen also encourages easy meal preparation, and the dishwasher does the rest. 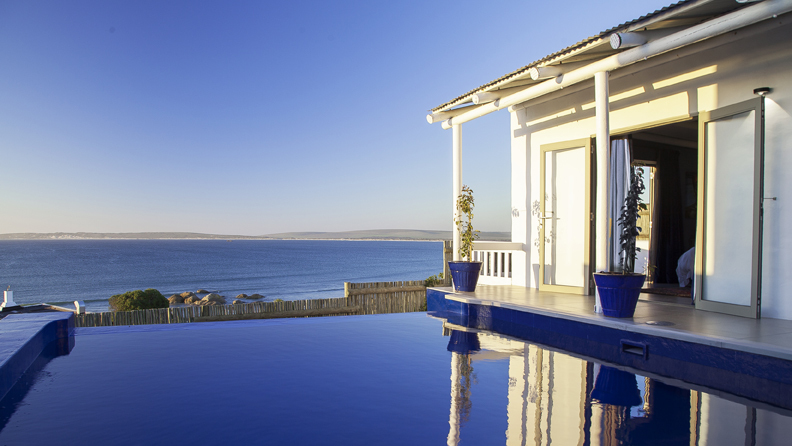 Both villas are also serviced each morning to keep them pristine and turn downs are done in the evenings – or not, should you request this. There’s plenty of flexibility too around service, to ensure your stay is thoroughly relaxed, enjoyable and luxurious. Both units have off-road parking, and Villa no 1 has a complimentary lock up garage – with an interleading door into the Villa. A night security guard and watch dog – for additional peace of mind – is also stationed outside the Villas. Before starting his shift, he’ll introduce himself to you, if you’re in.